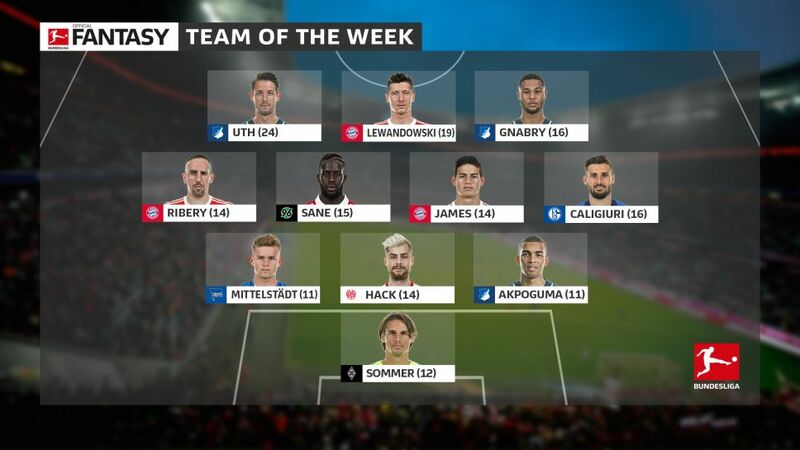 Bayern Munich trio James Rodriguez, Robert Lewandowski and Franck Ribery headline this week's team after demolishing Borussia Dortmund, while Serge Gnabry and Mark Uth also feature after Hoffenheim matched Der Klassiker's 6-0 scoreline against Cologne. Check out our all-star XI in full below! Gladbach have their goalkeeper to thank for their point against Mainz. The Switzerland No.1 denied the hosts on a number of occasions, but none more spectacular than his point-blank save from a corner, which he pushed onto the bar before catching the rebound while lying on the goalline. Hoffenheim were rarely troubled by a below-par Cologne side as they swept the Billy Goats aside with a resounding 6-0 victory. Part of the reason for the complete performance was 22-year-old Akpoguma, who hoovered up everything in front of him and won a commanding 13 challenges to send the visitors home utterly dejected. In a game with few clear-cut chances despite a number of attacking scenarios, the Mainz defender played his part in denying Gladbach’s attacking trident of Thorgan Hazard, Raffael and Lars Stindl by coming out on top in 17 of his tackles. The clean sheet ensured the 05ers a crucial point, but they remain behind Wolfsburg and still occupy the relegation play-off place. The man who spoiled the Bayern title celebrations, Caligiuri tucked away a penalty for his fifth goal of the season as he set Schalke on their way to victory over Freiburg. Doing his bit for the Royal Blue cause with his goal and tackling, Schalke are now on a six-match winning run which has delayed Bayern’s still inevitable coronation. Dortmund’s tormentor-in-chief during a breath-taking first half, the Colombian playmaker grabbed himself a goal and two assists for goal of the season contenders by Thomas Müller and Ribery as Bayern found themselves 5-0 up by half-time. Often found in a deeper position alongside Javi Martinez in the Munich midfield, James delivered a masterful display that stands Bayern in good stead for the upcoming UEFA Champions League quarter-final ties against Sevilla. Sane goals may be a welcome sight for Fantasy bosses, but not necessarily for Hannover. As in the other two games he has scored this season, the promoted side still went on to lose. But add to his goal a colossal 25 challenges won and he is a points machine. The veteran Frenchman is enjoying yet another purple patch in his long career with three goals in his last three Bundesliga games. The winger netted another – a sublime lob – in the demolition of Dortmund, as well as claiming the assist for Lewandowski’s second. He could have had two goals himself if not for the intervention of VAR. It is now four goals in four games for the on-loan Bayern forward, who has also been deployed at full-back in recent times. Two of those goals came this weekend as Hoffenheim took Cologne apart – in no small part down to Gnabry as his two solo efforts put Julian Nagelsmann’s side 2-0 up. His total of seven attempts on goal was in fact more than the entire Billy Goats’ team combined. Watch: Gnabry wanted even more goals against Cologne! Goals eight, nine and 10 for Lewandowski in his eighth Bundesliga match against his former club. The Poland captain has now scored a hat-trick in back-to-back home games to move level with teammate Müller as Bayern’s fourth-highest goalscorer in Bundesliga history on 103. Much like most of the Munich team, Lewandowski was simply too much to handle for Dortmund. A handsome haul of 24 points for the Hoffenheim forward as he put Cologne to the sword. Two goals and two assists for the German striker saw TSG register their biggest ever Bundesliga win and extend their unbeaten run to five games. Uth will be joining Schalke in the summer, but may depart Hoffenheim with them back in European competition for a second consecutive season.